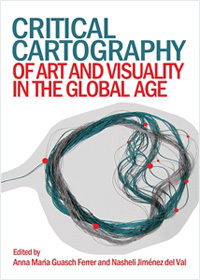 Critical Cartography of Art and Visuality in the Global Age poses fundamental questions and pinpoints topical discussions central to the field of contemporary art studies in the global age. Resulting from a series of conversations that took place at the international conference “Critical Cartography of Art and Visuality in the Global Age” (Barcelona 2013), the volume brings together current debates in cultural and identity-based art histories as a means of expanding the territory of contemporary art into the field of culture. With key contributions by Anna Maria Guasch, Jonathan Harris, Angela Dimitrakaki and T.J. Demos, the essays included here are grouped into four sections corresponding to central debates in global art studies: Archives and Networks; Utopian Globalists; Labour, Woman and Politics; and Art and the Post-Natural Condition. For each topic, a selection of leading scholars and arts practitioners from a range of geographic, disciplinary and institutional contexts have contributed their ideas, arguments, and approaches to contemporary art studies in the global age. Through its engagement with interdisciplinarity and practice-based research, the volume provides important coordinates for current debates in global art, as well as a cartography of the conceptual and methodological intersections that global art studies addresses today.